'Darling Who Knows' OGB+ (Luella Danielson, R. 1997). Seedling 77-1 L. AB, 16" (41 cm), Midseason bloom. 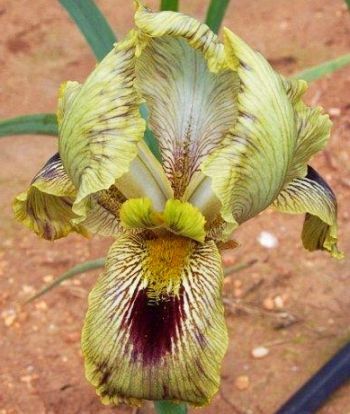 Standards soft cream ground with dense bright canary yellow veining, bright yellow margin, midrib apple green; style arms bright yellow; Falls soft cream, rust brown ray pattern and signal, dense bright canary yellow veining, bright yellow margin; beards bright yellow. 'Tel Hashi' X unknown. Pleasure Iris Gardens, 1998.